By D.M., March 12, 2013 – I do a great deal of photo restoration on old family photos. This book was very helpful and easy to follow. 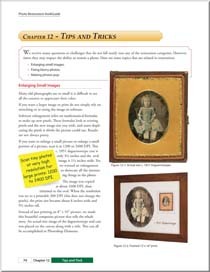 By J.K., April 13, 2013 – This book by Gary Clark is the best I've read on repairing photos using Photoshop Elements. 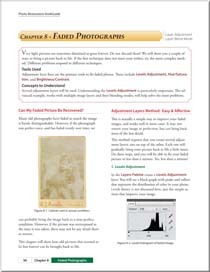 His explanations using good illustrations makes restoring my photographs easy. Although the book is less than 90 pages, it covers the areas of restoration that are most often used on photographs, especially older ones. Amazon.com Photo Restoration KwikGuide page here. 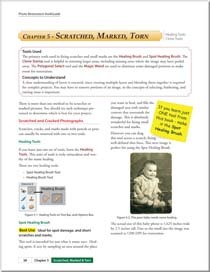 See Sample chapter PDF pages. A companion website allows the reader to download high resolution images from the book, and perform the same steps during the learning process. 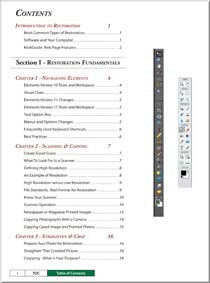 PDF downloads of short cut keys and tool maps can be found along with extra tips and restoration ideas. Also, see us at major genealogy conferences for show specials. Our schedule is available here. 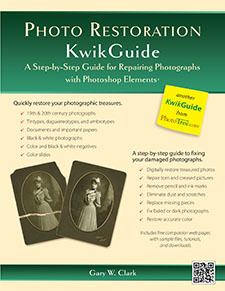 The Photo Restoration KwikGuide presents an easy-to-follow approach to the problem of fixing damage to valuable photographs. Bring faded pictures back to life. Lighten pictures that are too dark. Fix face and body damage. 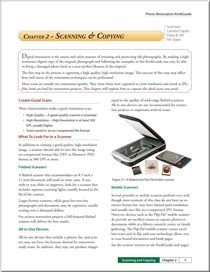 In addition, the Photo Restoration KwikGuide presents the fundamentals of image editing, along with tutorials on scanning, file recommendations, resolution, and other necessary concepts to master. 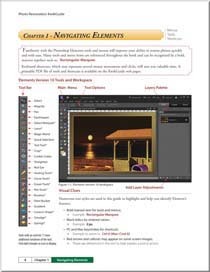 A companion website allows the reader to download the exact images used for illustration, and perform the same steps during the learning process.